As Pittsburgh bloggers and fans, we love to make light of the Pirates' failures. It is one of the things that keeps us going year after year. One popular topic is the unbelievable streak of injured first round draft picks over the past decade. I think we sometimes forget that we are joking about incidents that have severely altered the lives of young men. Earlier in 2007, John Van Benschoten made his triumphant return to the Pirates. After battling injuries for years, he pitched in a Major League game for the first time since 2004. While the results were not great, it was nice to see him overcome such difficulties to return. In less than two hours, another player will make his much-anticipated return from a major injury. 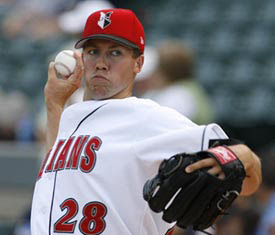 Bryan Bullington made one appearance with the Pirates in 2005, allowing two runs in 1.1 innings. After missing all of 2006 due to shoulder surgery, Bullington will make his first Major League start at Busch Stadium today. To this point, his season has been encouraging for a player returning from a major arm injury. No matter what happens in today's game, it will be a very special day for Bryan and his family. We should all be rooting hard for Bullington and Van Benschoten to find success in the future. Note: Cory has written a much more detailed post about Bullington's story.